Amish + Spanish = a match made in American home furniture heaven! This exceptional barstool is handmade in Shipshewana, Indiana, by expert woodworkers who manage to inject the beauty of Spain into this excellent piece. A supportive back splat is also made attractive with symmetrical panels. Shown with a fabric upholstered seat, this added comfort will have you feeling at ease for hours. Should you choose to do without the upholstery, you will still be comfortable thanks to an expertly contoured wooden seat. 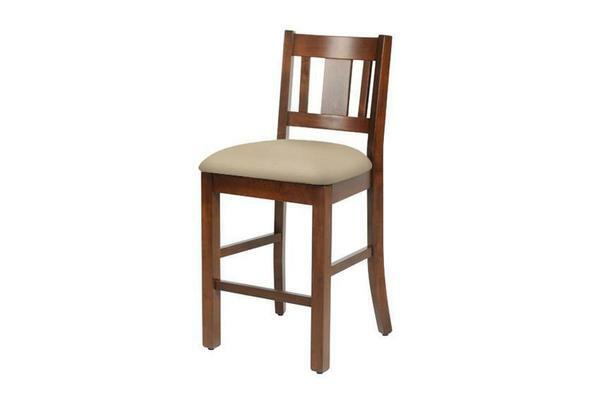 Take a look at Amish Benito Swivel Barstool for the same design with an added feature! No matter which option you choose, you can count on the exceptional skills of our seasoned craftsmen. Please feel free to give us a call at 866-272-6773 to speak with a friendly specialist about all of your options.